Since Mabel started preschool months ago, I've heard very little from her about her school day experiences. When I ask, the majority of the time I get a very teenage response, "Stop asking me questions!" I stop and we drive along in silence until we come up with some impromptu game that creates fun connections and chatter, but still no answers. A week ago she was coming down with something, maybe the flu, and I didn't know it yet. The teenage attitude and toddler tantrums came on strong and I was at my wits end. Rather than continue the power struggle, I pulled out some craft supplies and we got busy. It wasn't totally easy from there on out, but when we make stuff together the only rule is to keep the materials (glue, paint, etc.) on the paper set aside for arts and crafts. Beyond that? There are no right or wrong ways to make things. The looseness of creating helps clear up the air. 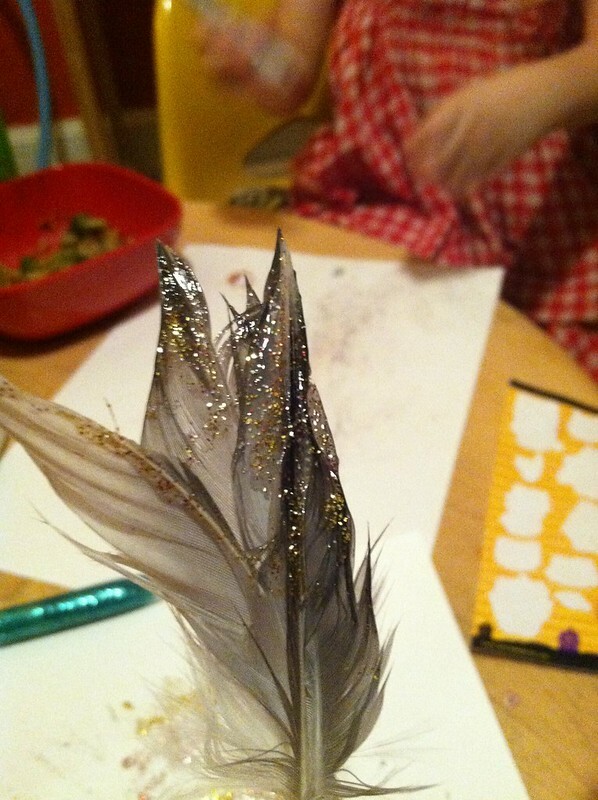 As a reminder to myself, and perhaps a tip for others: When communication is down and all else fails, use feathers to paint with glitter glue and let the connection reset.